After a riotous set supporting Hooton Tennis Club at the Kazimier, Getintothis’ Adam Lowerson weighs up the credentials of rabble rousers Trudy. Everything Bill Ryder-Jones touches in 2015 seems to be turning to gold. First of all, his latest LP, West Kirby County Primary, is up there with the best music he has ever made, and his production on Hooton Tennis Club‘s debut added to what is one of the top records of the year. Now with the latest band he has taken under his wing, Trudy, he seems to have hit the jackpot yet again. 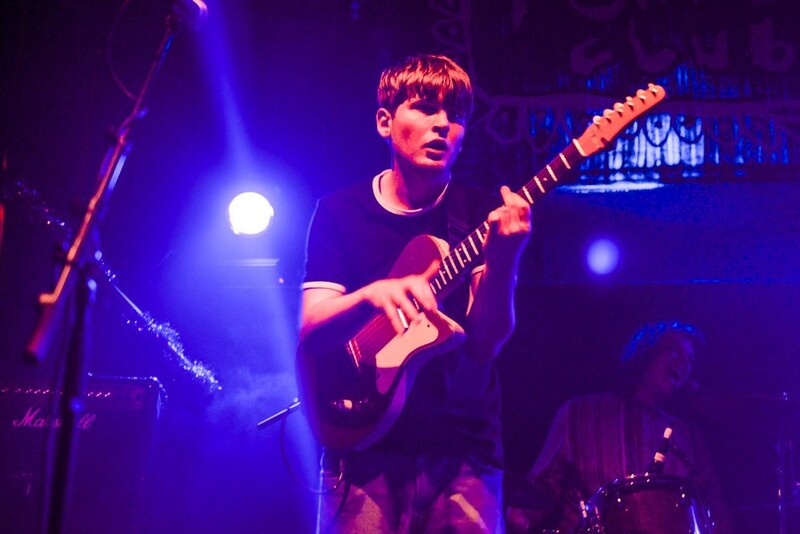 With heritage split between Leeds and Liverpool, the youthful trio have made an instant impact in the handful of live shows they have performed so far. Most notably, their support slot for Hooton Tennis Club at the Kazimier certainly announced their arrival as ones to watch and justified the whispers of serious industry interest. It’s quite rare now that a new guitar band comes along who have something genuinely unique about them, but it is actually quite hard to find another band who sound like Trudy. Their influences come from everywhere. There’s bits of Chuck Berry, hints of the Cramps and inspiration from genres from rockabilly and surfer rock to punk. They sound like everyone and no one. What’s most impressive though is the raw energy and aggression in their live shows. Anyone who witnessed their set at the Kazimier earlier this month can vouch for intensity in their performance. It’s almost primal. Their baby faced frontman has a certain rock and roller arrogance with way he sings, belting out yelped vocals in energetic bursts before ending each song with an innocent smile. The force with which he plays his guitar it’s a wonder there’s any skin left on his fingers by the end. Their sets keep you on your toes, too, and tracks such as Behave and their debut single All My Love showcase their edgy style. No songs follow a simple structure, jerking and jiving all over the place making it impossible to tell where the melody or rhythms are going to end up next. But most importantly of all, Trudy are a lot of fun. And beneath the racket of the scratchy guitar jangles they have some genuinely good pop songs. It’s early days but Trudy seem the business, and under Bill Ryder-Jones’ guidance it’s easy to see them making a similar rise in popularity to Hooton Tennis Club.